My favorite part of being a design blogger is telling stories. Products come and go but what connects all of us to an artist and their work is knowing a bit of their background, their passions and quirks. What is their story? For John Petersen, his design story begins in Atlanta, Georgia where he lives with his partner, William and their exuberant four year old daughter, Riley. John has always been the creative type with a love for crafting and styling. He recently decided to collect jewelry pieces for Riley in anticipation of her wanting to play dress up. 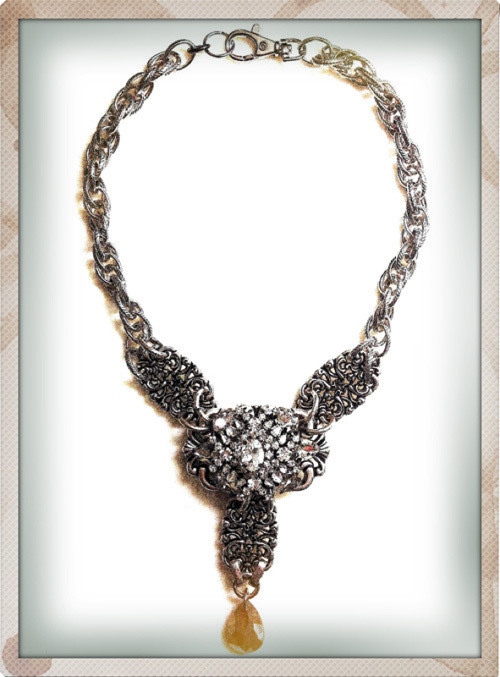 From friends, antique and thrift shops, John soon amassed a large collection of new and vintage jewels. John, "I decided to try my hand at crafting a one of a kind necklace for a friend. 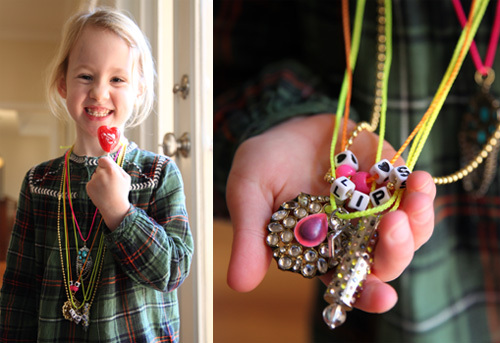 My daughter wanted to watch and before I knew it, she was helping me create the necklace." Like many people who discover a passion, John decided to delve deeper. His one necklace became two necklaces, then dozens and dozens more. He loved curating the jewels, crafting new, original pieces and was encouraged by the positive reception. I have to say, it was very sweet seeing Riley practice making her own necklaces alongside her dad. The little time I was at their home, Riley was learning how to count, spell, tie a knot, use her imagination and better know her dad. When it's jewel making time, the two sit side by side at the dining room table- John with his supplies on one side and Riley with her supplies on the other. Riley creates necklaces for herself and friends- or their lemonade stand in the summer where she sells her colorful creations for $1 a piece. Good deal.